We’re going to Paris! Our flights are booked and we rented a cute apartment in Le Marais for an entire week. I’m excited to try macarons for the first time, eat pain au chocolat everyday and simply wander the streets of Paris with Andrew. I would be delighted to hear any insights you have on your favourite Paris secrets. Do tell! Of course, a special trip to France deserves some custom-made items. Top priority are – a summery dress made from white eyelet fabric, a versatile bag with pockets and zippers that will be secure from pickpocketers (It happened to me once before!) and a new strap for my camera. I’ve added these to my crafty list. The stack of reading/viewing on my bedside table has been kept fresh with special thanks to Isabelle (Buttons), Shana (Twilight! ), Paris (Julie N), and Katrina (How to improve your quilting stitch). I’m working my way through this pile as quickly as my 16 hour days will let me. While it’s the startling wall of colourful wool that makes the journey entirely worthwhile, they also have an incredible collection of buttons and edgings and patterns..Meet the crafty french community! Walk up Rue du Louvre to get there and time it so that you nab your morning croissant and ‘cafe creme’ at the resto around the corner. Afterwards sit on the beautiful steps of the nearby and impressive cathedral of St.Eustache…Bon voyage! AHHH!!! PARIS!! You will have such a lovely time! I have never been there in the summer, only in the winter. It will be so beautiful! Ok, here are my short list of things to go see, and I have been to none of them. I found these out, AFTER I went to Paris! 🙁 so I tell everyone to go here! And Coton Doux is a great shirt store. I got these shirts that actually fit me(where most other ones usually look funny on my frame), and their fabrics are pretty! It is on Rue Mazarine, south of Rue Guénégaud, just across the river from Marais. I need to make a camera strap for my canon film camera! I want to see yours first! Good for you! I’m glad to hear you’re taking a week off! WOW! I don’t have any recommendations as I have only been to Paris once and it was in high school. I’m sure it’s all wonderful. I am working on a list for you – but for now, I always get a kick out of reading the Luxe Guide to Paris in our office. I will try to sneak a copy out to lend you! Jealz! I went to Paris when I was 17… feels like forever ago. 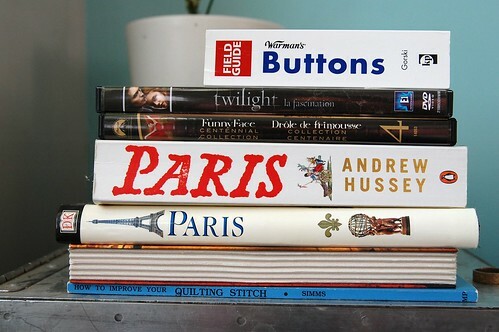 I believe D*S has a few Paris design guides. I also applaud you for taking some well-deserved time off. Also near St.Eustache mentioned above, is rue montorguiel which is a fun market/restaurant strip. Lots of locals, not tourists. There is a fun bar just over on rue montmartre called le coeur fou that is fun. There is a muji store in the marais. Also, in the marais, La Belle Hortense on Rue Vieille du Temple is super cute. Books and wine, how nice! Wow! You’re going to love it! Le Marais is my favourite parisian quartier! I lived in Paris for 6 months in 2004 and I still long for that city. I’m going to think of special places and then I’ll send you an e-mail. You must get Patricia Well’s “Food Lovers Guide to Paris”… it’s broken down by neighbourhood and also has things like best bakery, best pain au chocolat, best tea room, plus some recipes. Pain Poilane on Rue du Cherche Midi is a famous old place that has artisan bread that is shipped all over the world. Definitely worth checking out! You must check out the Agnes B shops… lovely simple styles. What fun! Make something is coming to Paris!!!! I’m in a hurry to see what you ‘ll sew for your trip. Tell me if you need some adresses! I am glad for you that you are coming to Paris ! I have been reading your blog for quite a time now and it’s like you’re coming to visit me ! Speaking of macarons you have to try the famed Pierre Hermé ones, my favorite is the white truffle one (just to die for), you must also try the chocolate ones if you are into chocolate. For the fruity flavors I prefer Gerard Mulot (rue de Seine in the 6th). Arrgh, now I am hungry ! If you need a guide, an interpreter or anything else in Paris, I’ll be glad to help you, you have my email ! oh, paris. how i love you. and i’m super excited that you get to go! you are going to have a marvelous week. soaking it all up. I love Paris. I have been several times, but lately I haven´t have the opportunity to go again. I have to special places there. One is Rodin museum, just near Les Invalides, where Napoleon is buried. It is a little pretty museum, where most of the scultures are outside in the garden, includying the famous “the thinker”…the place is not crowded and the garden invites to lost and discover diferent views. The othe one is Le Marais, it is a part of Paris, full of design shops, independient shops, coffes and a not very touristic ambient. Good to get lost. Hope this helps. Have a blast! Super Exciting!!! I won’t suggest what and where to eat- you will be in Paris, and cannot go wrong!! A few things to offer, though: please wear comfortable shoes, even if they are not chic. You will not realize how much walking you will do until your feet are screaming in protest. Also, remember to eat! Frequently! You will not realize how much walking you will do, and your stomach will forget to scream in protest because there is so much fabulousness to take in. I will recommend the Louvre to visit the Mona Lisa, of course. To stand in the same room and admire the most famous painting the world… well, it’s weep-worthy. When I went with my sister, on our last day we took one of those scenic boat rides on the Seine, which was the perfect way to wrap up our trip. You will have a great time no matter where in Paris you go. Enjoy!! How lovely! We are considering Paris for our honeymoon in the fall – would love any details about the apartment you’re renting. I’m reading Marie Antoinette’s biography right now and will be followed by a book on the French Revolution. I am dreaming of macarons as well! You should absolutely visit some “passages” : covered streets built around the ends of the 19th century. They are used as shortcuts in between two main roads, and many of them have really beautiful old fashioned shops. “La Droguerie” is brilliant but I hate going to their main shop (rue du Jour) because it’s always crowded. Instead I go to “Le Bon Marché” department store, where La Droguerie have a “corner”. The shop assistants over there are really nice. And don’t forget to write down your name on the list when you arrive in the shop (there’s no proper waiting line) ! Ok, I’ll stop now !!! Have a nice time in Paris !